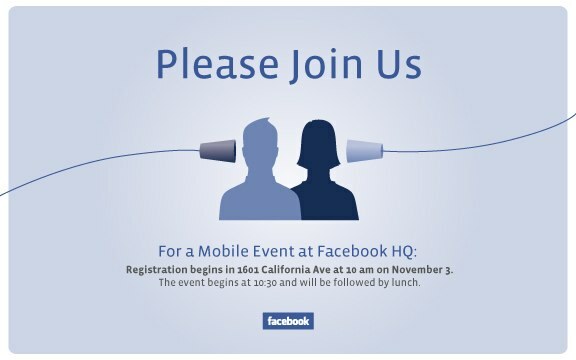 Facebook has just sent us an invitation to a special event that’s happening this Wednesday. The theme? Mobile. We don’t know what Facebook is planning to launch (though we’ll do our best to find out beforehand), but we have a few guesses. The most obvious is the company’s long-awaited iPad application (it still doesn’t have an official app). It could also include more features that involve Places — Facebook has recently been testing a Deals service that’s connected to Places, and mobile is obviously the best place for users to access those. And, of course, it could be related to the elusive Facebook Phone, though when we spoke with Mark Zuckerberg about this last month it sounded like the Facebook’s (unconfirmed) custom version of Android was still a ways off. Perhaps it’s a deal to integrate Facebook more deeply into some partner handsets? Facebook’s last big event was on October 6, when the company rolled out a totally revamped Groups feature. Oh, and try not to look too hard for hints on the invite. Everyone who did that last time was totally wrong.